We’re now a few months deep into 2014 and that means we’re graced with yet another addition to the Magic the Gathering card game app for mobile platform. Wizards of the Coast have done well this year, adding in plenty of new features and additional cards to give your planeswalker more power and diversity then ever before with the popular card game app. For any who aren’t familiar with the popular card game, Magic the Gathering started out as a trading card game back in 1993, since then the game has become hands down the most popular trading card game ever. In effort to expand the ever loved franchise, Wizards of the Coast have released the card game in formats in other than cardboard paper cut-outs. With console and PC video games, as well as a entire online game that operates just like the card game, but over a network connection rather than across a fold-out table. Both the actual card game and its online counterpart do have a fairly large drawback and that is that it can be insanely expensive to be able to play on nearly any competitive level and the learning curve can be extremely daunting to new players. This is where the Magic the Gathering app shines, it not only provides a cheaper way to learn how to play and experience the game, but it does it with a touch of excellence in design as well. The game is definitely designed with new players in mind, yet many veterans of the game will also enjoy it merely because of it’s smooth and well thought-out design. The biggest feature in the game is by far for players who either have never played Magic or who have little understanding how the game fully works. The game has a intuitive tutorial which will explain how the game and cards work as you play, so rather then sinking an hour into a boring tutorial, you can jump right into the action and learn as you go. Each of the cards allow you to do a zoom-in mode which offers additional information about the cards powers or abilities. For example, you might see that a card says Bloodlust, but does nothing more to elaborate on what that means, by tapping the More Information button you’ll receive in detailed information on each of the cards abilities that aren’t described on the card itself. It’s a safe bet to say that playing through the games primary campaign will give you enough understanding how the game is played to be able to pick up the actual card game and take it from there. 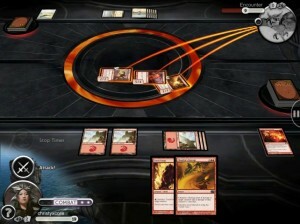 As with the last release Magic 2013, the game offers a campaign mode which pits you against several different challenges, as well as other planeswalkers. The challenges are often facing up against non-standard decks that will usually blast off the same two to four cards over and over, this really helps the player devise strategies against particular attacks and defenses you might see playing against another player. When you face off against a planeswalker, it’s more like having an actual duel with another standard deck. This mode by far gives the best basic understanding of not only how to play, but how to come up with basic planes of attack and defense. The newest feature and by far my favorite, is the new Sealed Play campaign. This mode will give you the best Magic experience, as you start off by opening several booster packs with random cards, you then build your own custom deck from the cards you received. You’ll then face up against other decks winning more booster packs to bolster your decks power. The deck manager is extremely easy to use allowing you to sort by rarity, color, or mana cost. It also has a auto-complete option which will have the AI finish building a deck for you, so if you’re still new and can’t decide all of the cards you should use, you can pick a number of the cards and have the AI finish building the deck for you. The game also offers online play to match yourself up against other players, which includes different game modes like 1v1, 2v2, and more. Each person has their own profile which entails with a avatar picked by the player and also tracks all sorts of stats like most used mana color, win count, and titles earned. For new players, it’s a good idea to play the game in this order Campaign Mode, Sealed Play, and then explore the multiplayer mode. Even for veteran players, going through the campaigns is generally a good idea as both campaigns will unlock more cards for your arsenal. The user-interface is also something that makes this Magic game stand out from the rest. If you’ve played or seen Magic The Gathering Online, you’d know that the interface is fairly bland, if not flat out ugly and clunky. Magic 2014 not only offers a slick and good looking interface, but also one that is extremely easy to use. They’ve even added in some special animations for especially rare cards, so when you zoom in on the card it will display a animation with the cards picture. 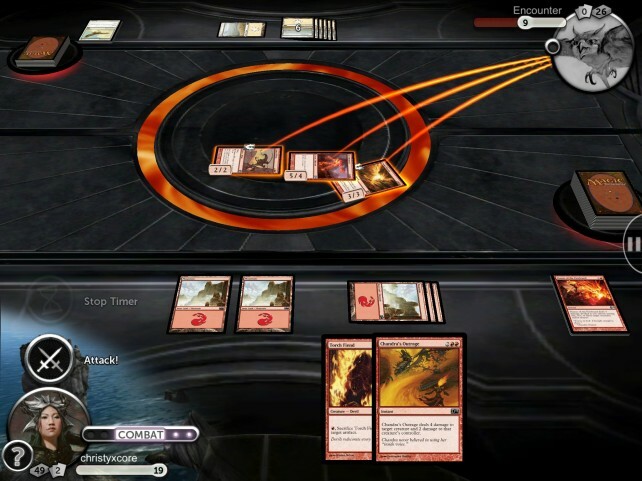 The main disadvantage between the Magic Online card game and the Magic 2014 game, is that in Magic 2014 you only have a relatively small amount of cards to play with in comparison to the full card game. That’s not to say there isn’t a lot of available cards in Magic 2014, just that there are several thousand unique cards in the actual card game. 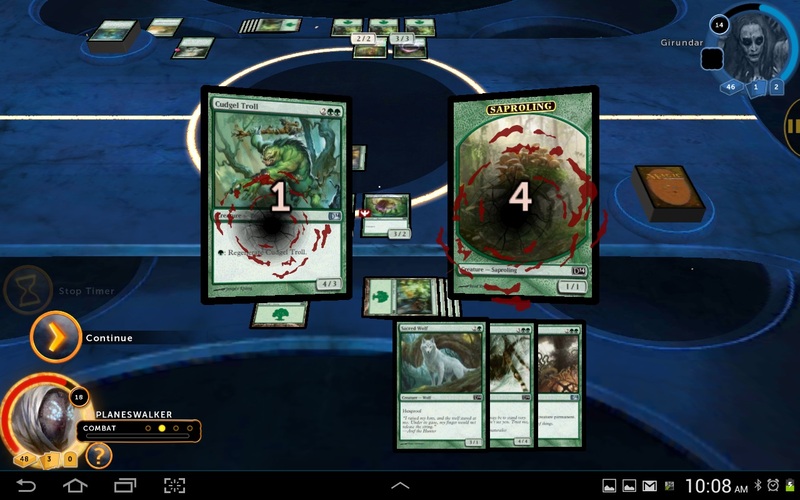 Honestly, if Wizards of the Coast would put enough effort into making their full Magic Online game look and operate anything like the Magic 2014 app, they would have people tripping over them self to play it. 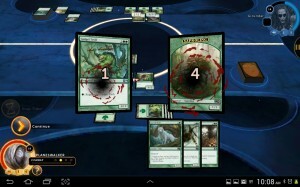 Whether you’re a new player or long-time veteran, you should find yourself enjoying the colorful and robust interface of the Magic 2014 app. 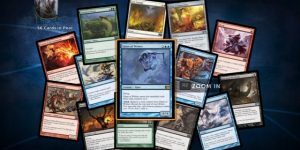 If you find yourself enjoying trading card games, with actual cards or just ones in video games, there’s a extremely good chance you’ll enjoy Magic the Gathering. With over 10 years of building this card game it offers endless creativity when it comes to building decks and organizing your strategies against your opponents. It’s by far one of, if not the most in-depth card game I’ve ever played, yet it’s learning curve allows players to learn small portions at a time, rather then delving hours into a thick manual. There’s a great satisfaction when you’re able to turn the tides of battle and pull out a huge win, when you’ve been down and out the entire game. Magic 2014 offers enough diversity in its cards that you’ll most likely never have the exact same experience twice, unless that’s what you’re trying to accomplish. The game does hold a heavier price tag at $9.99 + in-app purchase options, but ultimately you are getting a very complete and full game for just the $9.99. 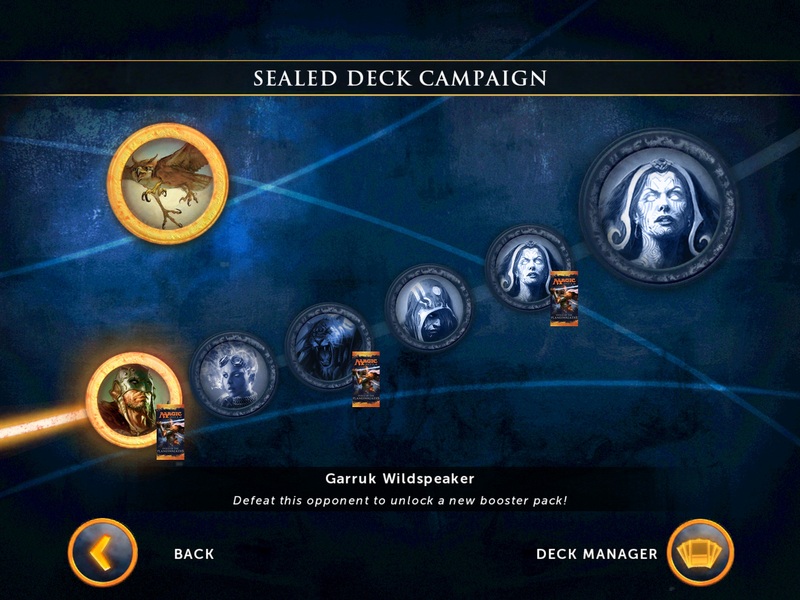 Most in-app purchases are only to unlock decks or cards earlier without completing the campaign or purchasing a complete foil deck, which only offers a cosmetic appearance. Magic: Duels of the Planeswalkers 2014 offers a extremely fun and robust experience and with everything you get for $9.99 is well worth the purchase. Considering it could cost you anywhere from $50-$200 to purchase the cards in MTGO (Magic the Gathering Online) or even the physical cards, it’s safe to say you’re getting a fair deal. With the new Sealed Play, new cards from last years entry, and a host of graphical improvements, it’s definitely a worth while upgrade from the 2013 edition. 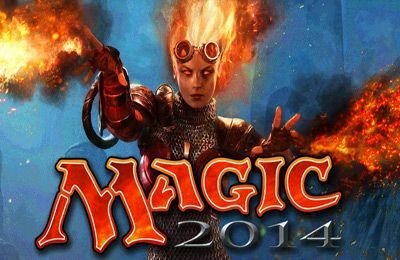 Magic 2014 remains a great, convenient, and affordable way to enjoy this long running card game. If you’ve ever shown any interesting in trying the game out, I would highly recommend you start with the Magic 2014 game, as it will not only provide a enjoyable way to learn how to play the game, but also give you a great experience on your mobile device. Some reviews have stated the game can feel clunky in its menu design, but I didn’t find any such experience on iOS or Android. The game is also available on Xbox 360, PC via Steam, and PlayStation 3 as well so usability may vary depending on your platform of choice. The app is free to download and try and costs $9.99 to purchase the complete game. Download size is around 1.5GB and requires Android 2.3.3 and up or iOS 6.0 or later.